Agua Fresca might be difficult to come by in UK cocktail bars, but making them yourself sometimes can be just as nice! Alternatively, you can find similar cocktails around which use real fruit juice and less sugar than your standard Margarita. 2 cups watermelon (rind removed), seeded and chopped. Other fruits to use could be melon, strawberries, papaya, mango, pineapple or cucumber. 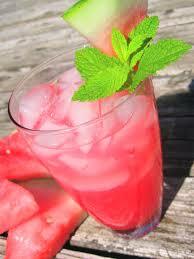 I use watermelon because it’s 92% water and full of antioxidants, which means it goes down well in the gut. They’re also good at producing a natural subtly sweet taste which won’t spike your insulin levels. All you need to do is cut up the watermelon into cubes and blitz in a blender with the sugar, lime juice and water. Then, through a strainer, force the pulp out.